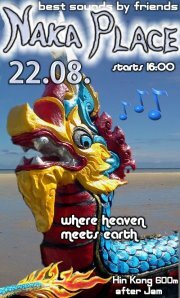 Naka Place is a cozy old skool Beach Place playing best Electronic in original Koh Phangan style. A place to hang out n meets interesting people whilst enjoying the immaculate view and music. For now Every Wednesday we play Sounds music by friends. DJ’s, Live Musicians, Live acts this small cozy venue on the long stretched beach of Hin Kong has the old Koh Phangan Beach Bar feeling. We intend to play music that cannot be heard otherwise in the bigger places. Unplugged it is an open cooperation between several people and artists wanting to have a space to enjoy themselves and others.